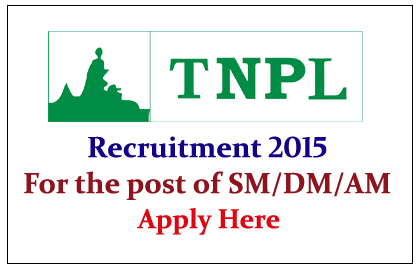 Tamil Nadu Newsprint and Papers Limited is Hiring for the post of Senior Manager / Deputy Manager / Assistant Manager in Marketing for the year of 2015. Eligible candidate can apply here on or before 21st May 2015. The Tamil Nadu Newsprint and Papers Limited (TNPL) was established by the Government of Tamil Nadu to produce newsprint and writing paper using bagasse, a sugarcane residue. The Government of Tamil Nadu listed the paper mill in April 1979 as one of the most environmentally compliant paper mills in the world under the provisions of the Companies Act of 1956. The factory is situated at Kagithapuram in the Karur District of Tamil Nadu. The registered office of the company is located in Guindy, Chennai. 1.First Class full time Engineering Degree with PG Diploma in Marketing Management. Eligible Candidates can apply on or before 21.05.2015,for more details check official Notification.